Yves di Lena at YDL Yachting writes in to say that he's "keeping up with the industry trend" by making a €600,000 cut in the price of Feadship's 45m Secret Life. One for lovers of classic Feadships (and there are many of us), this canoe-stern beauty was built in 1974 and has only four owners since new, being continuously maintained to ABS class and now MCA compliant. 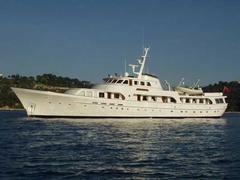 Refitted in 2002 and 2005, Secret Life accommodates 12 guests in five staterooms and is now asking €6.9 million.